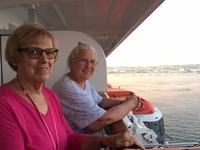 Friends and I wanted a cruise that would give us a chance to enjoy each other and be a bit pampered. The Eurodam roundtrip to Mexico from their home town in San Diego was exactly what we wanted. After several excursions on small ships, I was somewhat apprehensive about a large ship so I ordered an electric scooter from Scootaway. I have limitations in walking distances, and the electric scooter was just what I needed on the large cruise ship. I ordered it in advance and found it waiting outside my stateroom when I boarded, and I left the scooter at the gathering spot when I debarked. Our cabin steward put the scooter away and plugged it in to charge in the late evening and brought it back & left it outside our cabin when he came on duty the next morning. The scooter really allowed me to enjoy the ship (and not be wiped out when we mixed up bow and stern and ended up in the wrong end of the ship!) The ship was comfortable and the food was tasty and varied. We were not impressed with the Italian specialty restaurant as it&apos;s crammed into an alcove off a busy passage - not relaxing at all. The food is designed as small plates to be shared. There were 3 of us and everything came already divided into two portions. I asked the serving staff if they couldn&apos;t alert the chef that there were 3 sharing, but they said that it just was the way it came from the kitchen. And the food was just average. However, our reservation at the Asian specialty restaurant was a complete reverse of the just ok Italian. From the moment of sitting down in a lovely room to the enjoyment of every nuance of the meal, we were delighted. I believe that I can say that was the best part of the whole shipboard experience. 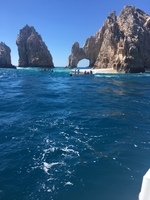 We signed up for one excursion in Cabo - that one took us on a boat tour of the bay where we had a chance to see the arch rocks close up and then we boarded a bus to go to the plaza and cathedral with time for lunch at one of the places on the plaza. We then boarded to bus again to go to the quieter Cabo San Lucas to enjoy a drink and heavenly views before finishing up at a glass factory. We had a fantastic tour guide and driver, but the tour involved a little more walking than I expected. I enjoyed the pool most days and learned a few more water exercises from other passengers - and shared a couple of mine. We caught various shows - both in the theater as well as smaller venues. All good but not fantastic. Spent time in the coffee bar and viewing lounge in the bow. Found it a great place to read, play our card games, and play around with the interactive maps - and a bonus of free pieces of very good chocolate.. I found the staff unfailing helpful and pleasant, the stateroom comfortable, the food good, the excursions a bit pricey, and many options for entertainment. All were good but not exceptional (except for the Asian specialty restaurant - that was 5 star!). We had a nice trip, enjoyed each other&apos;s company, and felt well taken care of. But, looking back, I think of it as OK - not superb. 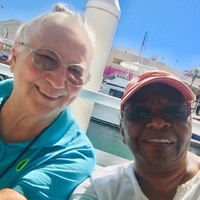 On our boat tour of Cabo San Lucas harbor. Friends and I wanted a cruise that would give us a chance to enjoy each other and be a bit pampered. The Eurodam roundtrip to Mexico from their home town in San Diego was exactly what we wanted. After several excursions on small ships, I was somewhat apprehensive about a large ship so I ordered an electric scooter from Scootaway. The ship was comfortable and the food was tasty and varied. We were not impressed with the Italian specialty restaurant as it&apos;s crammed into an alcove off a busy passage - not relaxing at all. The food is designed as small plates to be shared. There were 3 of us and everything came already divided into two portions. I asked the serving staff if they couldn&apos;t alert the chef that there were 3 sharing, but they said that it just was the way it came from the kitchen. And the food was just average. However, our reservation at the Asian specialty restaurant was a complete reverse of the just ok Italian. From the moment of sitting down in a lovely room to the enjoyment of every nuance of the meal, we were delighted. I believe that I can say that was the best part of the whole shipboard experience. 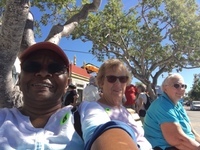 We signed up for one excursion in Cabo - that one took us on a boat tour of the bay where we had a chance to see the arch rocks close up and then we boarded a bus to go to the plaza and cathedral with time for lunch at one of the places on the plaza. We then boarded to bus again to go to the quieter Cabo San Lucas to enjoy a drink and heavenly views before finishing up at a glass factory. We had a fantastic tour guide and driver, but the tour involved a little more walking than I expected. I enjoyed the pool most days and learned a few more water exercises from other passengers - and shared a couple of mine. We caught various shows - both in the theater as well as smaller venues. All good but not fantastic. Spent time in the coffee bar and viewing lounge in the bow. Found it a great place to read, play our card games, and play around with the interactive maps - and a bonus of free pieces of very good chocolate.. I found the staff unfailing helpful and pleasant, the stateroom comfortable, the food good, the excursions a bit pricey, and many options for entertainment. All were good but not exceptional (except for the Asian specialty restaurant - that was 5 star!). We had a nice trip, enjoyed each other&apos;s company, and felt well taken care of. But, looking back, I think of it as OK - not superb. Connecting verandah staterooms. Mine had a king bed and theirs had twins. Cabin steward removed the barrier between our balconies so we could be together on the balcony. All were relatively small. Balcony barely had room for 2 chairs and a small table. TV was mounted on the wall opposite the bed. Small bath with shower. Cabinets at entrance had enough space to hang clothes and shelves for shoes etc. Wine price up - entertainment down- Kids in adult pool!